Order in 12 Hours 49 minutes 34 seconds for dispatch today! Every climber has stared up at a huge rock face and felt the desire to climb it. For many, this passion starts as a far-reaching dream, but after the first wall is conquered, it turns into a lifelong passion. 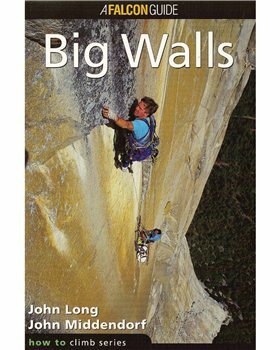 In Big Walls, John Long and John Middendorf, two of the most respected authorities on the subject, combine to give readers a wealth of useful information designed to give climbers achieve this big wall dream. Aid climbing, leading, following, multi-day routes, hauling, and solo techniques are but a few of the subjects covered in this comprehensive and popular manual. A handy gear checklist is also included. The next time you feel the urge to cast off on a massive piece of steep stone, pick up Big Walls – it has all the information you need to make it to the top.